Torin, Trevor and Jonathan, trinity of the Cup. Stanley St. Clair, straight-laced Keeper of the Cup, chosen to protect and serve hockey’s holy grail. 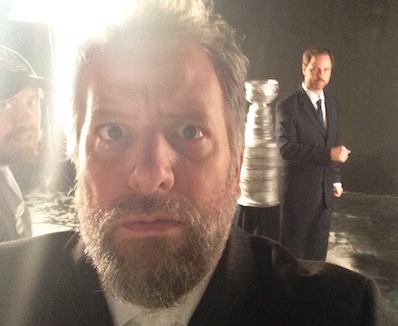 Not just a prize awarded to the greatest players of hockey, the One True Cup grants supernatural powers via Lord Beaverton, a mouthy 19th century English dandy whose *ahem* adventures with the Cup a hundred years ago left his soul trapped inside. Every generation Lord Beaverton chooses a Keeper as official caretaker and secret superpowered sidekick. Charged with the dangerous job of keeping the Cup’s true powers out of the wrong hands during the busy promo circuit Stanley and Lord Beaverton solve mysteries and fight crime. If it were up to Lord Beaverton they’d exclusively help exotic dancers.